ATHENS, Georgia – Georgia defeated Vanderbilt 43-13 in a game that was close until the second half. Vanderbilt was able to move the ball with small plays, but UGA kept the Commodore defense out on the field as long as possible thanks to strong performances on both sides of the ball. A bedsheet that hung outside an Athens, GA apartment on game day read, “Let’s Make Tennessee Like a Wendy’s 4 for 4: MTSU, Austin Peay, UT, Vanderbilt.” As #2 overall in the nation, UGA is the most credible challenger to the Alabama dynasty in the SEC, and possibly the NCAA. For UGA fans, the game felt like the final stop on a checklist before embarking on a regular season-defining, four-game stretch against other SEC opponents. Before entering a very loud Sanford Stadium on UGA’s homecoming weekend, Vanderbilt fans reminded themselves that last time these two teams played “between the hedges” here, Vanderbilt won 17-16. The Commodores gained their first major win of the 2016 season with swift offense and key defensive stops by Zach Cunningham in the final minutes of the game. A win in this one would replace last year’s game against Kansas State as the Commodores most recent victory over a ranked opponent, and more importantly notch a road W against an SEC opponent. Vanderbilt received the opening kickoff, but two deflected passes forced a punt. The Georgia defense may be the strongest Vanderbilt faced all season, as Shurmur had little pocket protection and recievers struggled to get open. 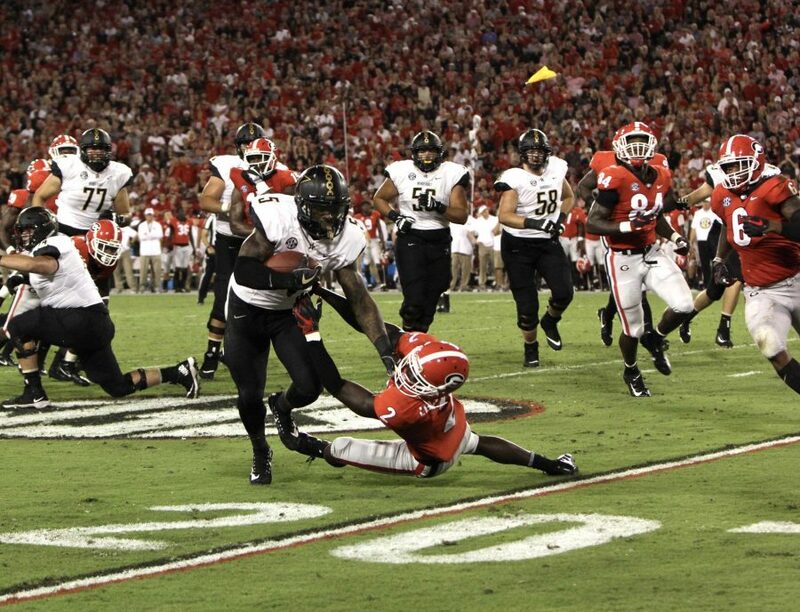 The only notable event of UGA’s opening series was a 30-yard punt return that was brought back by holding penalties. Vanderbilt got the ball back, and on the first play Ke’shawn Vaughn ran 43-yards to Georgia’s own 15. Subsequent runs were unsuccessful, bringing out the kicking team. Redshirt junior Ryley Guay punched a 25-yard field goal to give Vanderbilt a 3-0 lead 10 minutes left in the 1st quarter. Nearly as soon as UGA got the ball, quarterback Jake Fromm threw a high-flying, 75-yard pass that was caught by Terry Godwin and ran in for a touchdown. 7-3, UGA. On the ensuing drive, Shurmur completed a screen to K. Blasingame who then ran 22 yards for a 1st down. Vaughn made a 10-yard dash up the sideline but the play was negated by multiple penalties: holding (declined) and illegal formation was called against Vanderbilt, but Georgia’s unnecessary roughness penalty gave Vanderbilt a 10-yard lead. Jared Pinkney went down with an injury. Blasingame continued to push the ball down field until Vanderbilt arrived on UGA’s 20-yard line with one down left. Their run was stopped just short of a first down and the ball went to Georgia. After a week of competition in which Vanderbilt backs would alternate over long stretches of time, fourth-year Vanderbilt Offensive Coordinator Andy Ludwig decided to use a platoon system against Georgia. The entire first half was run and short-pass heavy. Blasingame was a top receiver and Vaughn led total rushing yards and length of carry. Redshirt junior Ryley Guay, who for this game got the nod instead of sophomore kicker Javen Rice, hit at 42 yard field goal to make the score 7-6 UGA before the half. UGA’s Cole Hartman had the secondary beat on a ten-yard out floater on the next drive but caught the ball out of bounds—the next play, Riley Ridley went to the same spot in the end-zone and caught a touchdown despite bobbling the ball through Vanderbilt’s double coverage to make the score 14-6 at halftime. Vaughn began the Commodores’ opening drive of the second half with a 12-yard run, but good coverage from UGA prevented a pass completion to Kalija Lipscomb which forced a punt with seven minutes left in the third quarter. Freshman quarterback Justin Fields, who became more of a fixture at quarterback as Georgia started to run away with the score. Fields didn’t complete many of his passes but caught the Commodores off guard when he started to rush. He put Rodrigo Blankenship in position to make a 44-yard field goal. Georgia 31-Vanderbilt 6. Vanderbilt forced a fumble when UGA attempted a goal line rush but it was recovered by Brian Herrien and a scrum of Georgia players to advance the bulldogs to a 38-6 lead. Harris Jackson of UGA caught a ball in the back corner of the end-zone, but was ruled out of bounds, forcing another Blankenship field goal to inflate the score to 41-6. With UGA’s second string playing, the Commodores kept running plays and eventually scored on a run by Josh Crawford with two seconds left on the clock.